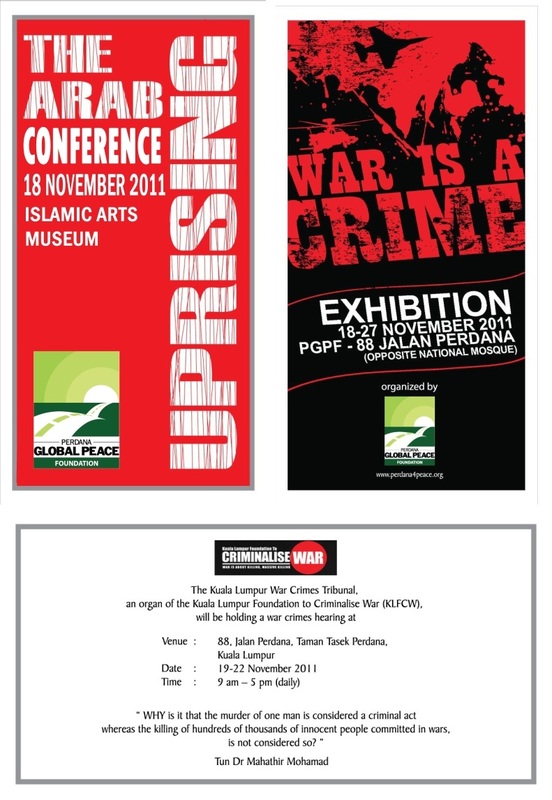 I'm proud to say that we, the Malaysian bloggers, have been supporting this project to criminalize war since the very beginning. Why? Simply because Malaysian bloggers are against war. And when Dr Mahathir first invited bloggers to cover the conference, most of us didn't think he was serious. I mean, Malaysian bloggers were then seen as "outcasts" by their own government. Abdullah Ahmad Badawi and his advisers were so anti-us that no BN politicians dared to open a blog; today, the majority of BN Ministers are blogging! Have Dr Mahathir's efforts been futile? It's making headlines all over the world, from Washington Post and Straits Times Singapore to Huffington Post and The Asian Correspondent: Malaysia to try Bush and Blair for war crimes! Symbolic it may be but the fact remains that a great many people want the real warmongers to pay for the lost of so many innocent lives. Out of interest since this is a trial and that Bush and Blair won't be there - who will play their roles and who will 'defend' them? Secondly Bush and Blair were not the only actors in this war. They had a number of co-conspirators who aided and abeted them in conducting the war. The Saudis provided bases and funding and are active in anti-Iranian activities as well. Qatar housed and funded the building of the US Central Command Base at Al Udeid which is the largest US Air Base in the Middle East and where both wars were commanded from. The King of Bahrain funded and housed the US 6th Fleet at Manama whose ships launched missles and air strikes. The UAE provided funds and built a large Air Base near Abu Dhabi which most of US Bomber command was located. Oman housed most of the British Forces at Muscat and Thamriq Air Bases as well as Naval Support in th Gulf. These States and their leaders wanted Saddam and the Taliban out of the way as both posed a threat to their regimes. All you need is the look at Google Earth and see how large the US forces are at these bases. Thus the leaders of these states should be on trial too. You just made an international fool of yourself. Tak de lain kerja ke? What about a trial on Malaysia's detention camps for asylum seekers and the abuses? Or a trial on the abuse of Police/MACC powers on detainees which lead to death. WTF. You can't solve your own country's abuses of power and you want to preach to the world about other world leaders. What crap are you writing about? Nowadays they don't even bother lying for genocide. In your face, "You get out or you get killed. Period." There's nothing very much anyone can do. Ironically, when before they were villains, one can only hope on the Ruskies and Chinks..for what it's worth. well,Madey should be on trial too !! The entire UMNO/BN should be on trial for crime against its rakyat !! ahhhh ... its not malaysia doing it bro, just some people, led by your hero. pls get this right. So when are you muslim malays holding a Symbolic Trial on President Assad of Syria......? ?....Oh Sorry...he is a muslim and he can Kill and genocide his own people like Mahathir did on May 13, to Penan and Memali......sigh. No wonder more natural disaster and economic crisis is going to hit Malaysia Soon.... Sunpahan Bumi on Malaysia!! manyak musuk lah lu locky! We are gonna put all the UMNO cows on trial too. Be the real mole, let's fight crime and corruption in Malaysia! but its all "perspective or subjective". Now even today the USA is setting stronger army base in north Australia...and am sure that this is delightful news not just to Japan or South Korea but also Vietnam and the Phillipines. Of course even MALAYSIA will surely take a good sigh of relief as the South China Seas disputes touches on our territory.. AGAIN as mentioned its all perspective OR SUBJECTIVE. As time goes on, many in the region will even forget whats happenning in the Middle east as the action will surely be where WE currenly reside..EVEN the "orang puteh orang barat" Americans will once again be "disanjung tinngi" by all and sundry including of course, the politicians riding high now. Should the malay mail even think of wanting to be the dragon slayer among the newspapers, it would be long, long battle because they have some wrong people running the paper now. terence fernandez is so, so overrated and does not have it in him to do what was promised intoday's front page of the malay mail. realities must be realized but what is going on in the paper is a case of ego building and promoting certain people as the white knights. we, the people at the malay mail, cannot understand why the assets of the paper are not being recognised and rewarded. the big salaries being paid to some people is akin to telling the world the ones who worked hard for the paper are shoved aside. the paper will never get to where it is being planned to so long as this management mentality exists. bringing malaysiakini into the paper is like telling reporters and editors they are no good and cant write the way mkini does. why does a paper have to put mkini above it? there is more to the mkini deal that meets the eye and we can only guess the motive. one might think everyone is motivated and are looking forward to the relaunch but truth be said no one is motivated. today, the sports editor mustapha kamaruddin, a long time malay mail journalist quit not because he wanted to but was told to leave because they wanted to bring in someone who many people see as problematic. actualy, this new sports editor resigned before disciplinary action was taken against him by the recently EIC yushaimi. a day before that the entartainment unit saw everyone resign including joe lee. today, there is not a single soul on the unit. since the new ceo and terence came in, a grand total of 35 editorial staff have resigned. nothing makes sense in this paper anymore. They wasted an opportunity to do a citizens' arrest of Dubya (aka George W.) who was in Singapore recently to address a business conference. During his visit to Singapore, Dubya met with Singapore PM Lee Hsien Loong and Lee Kuan Yew. Maybe such shenanigans as "symbolic trials" wouldn't be tolerated in Singapore which is one of the USA''s strongest allies in the Asia-Pacific region. The number of US MNCs with regional HQs in Singapore, and the cumulative pool of US FDI in Singapore - I saw a figure of US$40 billion recently - attest to this, as do the large number of US expats and their families who have chosen to work and live in Singapore. But, then, Malaysia is big on "symbolism" isn't it? And Najib will no doubt be making all sorts of apologies to the elites in the US Republican Party for whom George W. is one of their heroes! Do you want to be in Najib's position, having to make these type of calculations? Stop kidding yourselves ! The war is over.....let it sleep ....as old mahadev ain'nt an angel.! he had a bone to pick with those fellows so let him do it himself. Org lain dah pergi ke "3D".. Kita ke "black n white"
Hey, Dato, where is your post on the MAS/AA deal? LKY wet his pants in bed...ain't he the slant eyes NeoCon that played fiddle whilst Baghdad was burned to the ground by Blair and Bush bunker busters and tomahawk cruise missiles. Shahrizat and family should be put on trial !! Rocky, don't forget to be a good mutt and distribute this image of Dear Leader in all his hypocritical glory. How, can or not? Or does the Guidebook of Mahathir Bootlicking Techniques proscribe such acts? There are a lot of photographs of Dr Mahathir and yiour beloved, Anwar Ibrahim. This when he was Prime Minister and your beloved was his beloved deputy. Did Mahathir know then? No he did not. If he had known better, would he have posed with your beloved? No, of course not. Similarly, he would not have posed for the camera with Bush if he had known that Bush would one day cook up the WMD bull and fooled you and me and the rest of the world. Let's see now - a posthumous "symbolic" trial of the late Muammar Gadaffi for crimes against the Libyan people? 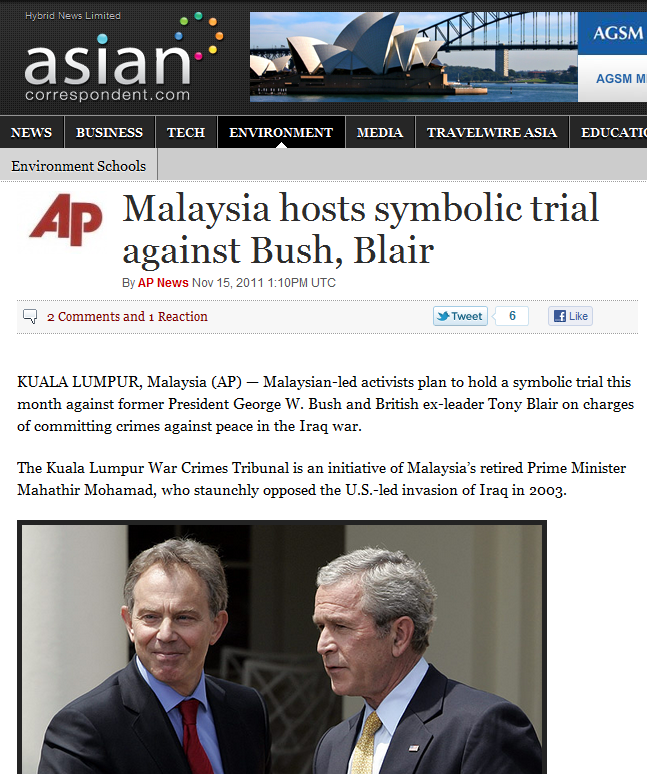 Or how about a "symbolic" trial of Dr Mahathir's good friend, the Mugabe dude? Or Hu Jintao for repressions against the Tibetans and the Uighurs? You can't pick and choose who you want to "symbolically" try! That's double standards of the highest order! Beloved? Rocky, is that the knee-jerk response you have been reduced to these days? Anwar is another one Mahathir's finest collection of mistakes and piss poor judgement. In any case, missing out a little piece of that Abramoff detail and $$$ paid to sit pretty for a 5min photo-op, arent we? Guess the mentality hasnt changed much since colonial times. Jasper, it is precisely because it is a symbolic sham that these intellectual and civilizational midgets can pick and choose the theme for their little make-believe party. Ironic, isn't it? Najib has a one-to-one meeting with Obama in Bali, while back in Malaysia, Bush is being put on trial, "symbolically". Ah, freedom of expression! A great thing, isn't it? Pity that Mahathir is only a recent convert to the cause. Maybe he saw the "light" after stepping down from power. Anyways, I think that our JJ in Washington, DC, will be engaged in a frantic round of fence mending, assuming that his Rolodex has speed dial to senior members of the Republican Party. Mr ink, Kevin Dan lain- lain yg bodoh! Apa yg you all nak pertahankan sangat bush Dan Blair just becoz u all anti umno Dan bn? Mr ink, Kevin Dan lain- lain yg bodoh tu dulu Chairman depa buat kat Moyang, sampai hari ini tak berani buka mulut, takut kena pancung! Apa Brahmin buat pun tutup mulut, satni takleh masuk restoran atau kedai kain mereka - naik kasta itu. Hai Omputih kan their Masters, dulu dan selama2nya akan dipuja.. tengok aje yg kawin dgn Omputih, bila bergambar sengeh macam kerang busuk (yg dpt pingat dari US tu pun sama aje). What we really need is a trial of the Sultans and Raja's. Lets see which one of them have been ripping off the RAKYAT. Every Malaysian should be equal. Malay, Chinese, Indian, Kadazan, Iban, ... The identity is not important. Achieving economic development, raised standard of living, equal educational and job opportunity is important. We look forward to a BN government that I fair. If BN cannot convince us that BN is fair, why not we give PKR a chance. Vote them in onetime, no harm trying.